Women’s Giant Slalom gold medalist Mikaela Shiffrin of the U.S. celebrates during the Olympic victory ceremony in Pyeongchang. That’s one way to go for the gold. On Feb. 15, skier Mikaela Shiffrin took home gold for Team USA in the women’s giant slalom event. While her Olympic competitors were likely abuzz with anxiety, the 22-year-old Colorado native kept her cool with a customary ritual before her victory-cinching second run: napping. Of course, Twitter had a lot to say about the ski star’s wellness habit, likening her to a “superhuman.” As evidenced by photos she’s shared on social media, Shiffrin is a longtime fan of rest and relaxation. “Level of calm I aspire to achieve: Mikaela Shiffrin being able to take a nap in between slalom runs competing for a gold medal…” one user wrote. “While you were sleeping: Mikaela Shiffrin took a nap, then won gold. As one does,” another quipped. An essential element of her daily regime, Shiffrin told Outside Magazine that though she averages at ten hours of sleep every night, she wakes up excited to later go back to bed. “[T]he first thought I’ll have [upon waking up] is: I cannot wait for my nap today. I don’t care what else happens. I can’t wait to get back in bed,” she told the outlet. Envisioning victory on the slope sounds like sweet dreams, indeed. Former Secretary of State Hillary Rodham Clinton is interviewed during a gala at the Metropolitan Museum of Art on Dec. 4, 2013, in New York. Step aside, Jon Stewart. There’s a new political satirist in town. Hillary Clinton, the former secretary of state and a potential Democratic presidential candidate, took an apparent shot at Fox News during the Super Bowl on Sunday. The tweet, which had been retweeted more than 30,000 times by the start of the game’s fourth quarter, was apparently a reference to the cable news channel’s coverage, which has been highly critical of Democrats and the September 2012 terror attack on the American consulate in Benghazi, Libya. 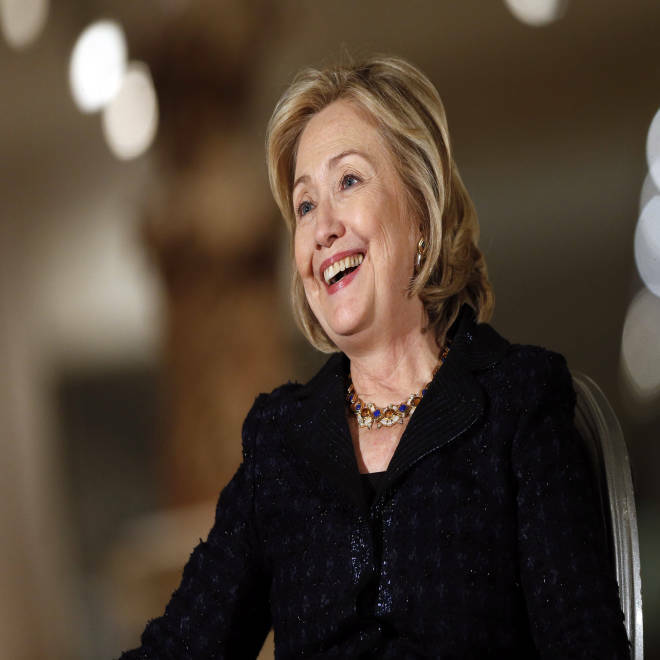 Clinton has come under fire for the State Department response to the attack. The Fox broadcast network — which aired the Super Bowl — and the Fox News Channel are both owned by the Fox Entertainment Group subsidiary of 21st Century Fox, a division of News Corp. Racial discrimination isn’t just a civil rights issue — it can also affect teenagers’ health, a new study suggests. Adolescents who experienced frequent racial discrimination without emotional support from parents and peers had higher levels of blood pressure, a higher body mass index, and higher levels of stress-related hormones at age 20, placing them at greater risk for chronic disease as they get older. While other studies have looked at perceived racial discrimination and health among adults, this study, published Monday in the journal Child Development, is the first of its type to track the effects in youth. The good news: Teens who did receive emotional support didn’t show the biological effects of racial discrimination. Researchers wanted to look at the relationship between racial discrimination and what scientists call allostatic load, basically the “wear and tear” on the body over time caused by frequent and repeated stressors. Frequent activation of the body’s stress response causes a cascade of problems including high blood pressure, cardiac disease, stroke and increases in the body’s inflammatory response. The researchers also wanted to determine whether parental and peer support would help mediate that stress, leading to potentially better health outcomes. The study involved 331 African Americans, all of whom lived in the rural South, who were asked to rate the frequency of perceived discrimination at ages 16, 17 and 18. These discriminatory events included racially based slurs and insults, disrespectful treatment from community members, physical threats, and false accusations from business employees or law enforcement officials. Blood pressure, body mass and stress-related hormones were assessed when youths turned 20. The researchers controlled for variables including low economic status, depression, or unhealthy behaviors such as drug use, for example, all of which can affect health. Although many African Americans, as well as other minorities, experience discrimination as a stressor, only a small percentage show increases in the biological havoc that stress can cause. In recent years, racial discrimination as a stressor affecting biology has been the subject of numerous studies, mostly involving adults, says David Williams, a professor of public health at the Harvard School of Public Health. Other research has shown that racial discrimination and resulting health problems are a global phenomenon. Although the study does have some limitations since researchers still must determine the mechanism by which parental or peer involvement actually worked in reducing the stress response, it challenges researchers to explain “the how” of their findings, says Megan Gunnar, Regents Professor and Distinguished McKnight University Professor, Institute of Child Development, University of Minnesota. For caregivers the message is simple. “Just sitting with them, gauging how they are doing is not race specific, it is important across all races, and can have a powerful effect in buffering the effects of discrimination,” says Brody. 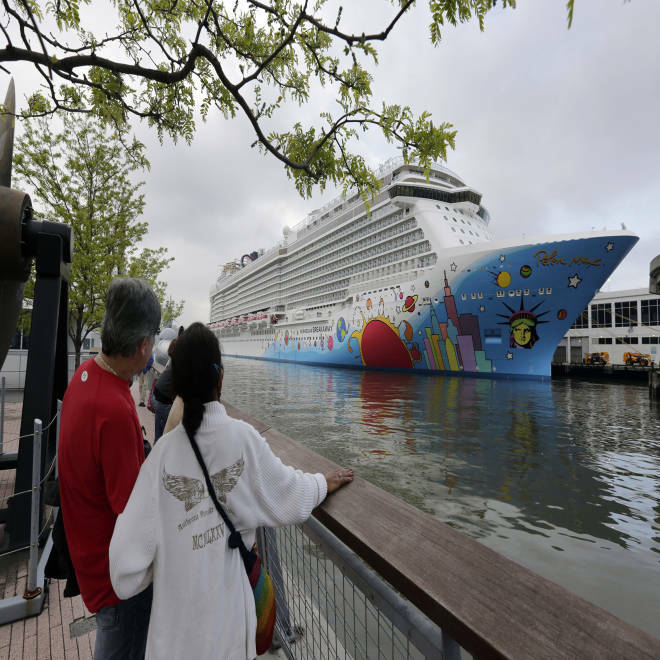 People pause to look at the Norwegian Breakaway on the Hudson River in New York in May 2013. A 4-year-old child died after being pulled unresponsive from a swimming pool on the Norwegian Breakaway on Feb. 3, 2014. A 4-year-old child died after being pulled unresponsive from a swimming pool on a Norwegian Cruise Line ship off the coast of North Carolina on Monday, cruise line and Coast Guard officials said. Crew members were able to revive a 6-year-old boy also found in the pool. He was airlifted to a hospital, where his condition was unknown. The two children were found in the morning on the Norwegian Breakaway, the cruise line said in an announcement on its Facebook page. The statement did not give the ages of the children, but Coast Guard Petty Officer Adam SanSoucie said they were 4 and 6. An emergency medical team on the ship gave both children CPR, but the younger child died, the cruise line’s statement said. The older child, a boy, was airlifted with his grandmother and a nurse to a hospital, the company said. It did not identify the gender of the younger child. SanSoucie said the boy was taken by Marine rescue helicopter to Carteret General Hospital in Morehead City, N.C. The boy was then transferred to Vidant Medical Center in Greenville. A spokeswoman there didn’t immediately return a phone call Tuesday. The 4,000-passenger ship was bound for Florida. The Norwegian Cruise Line website describes the Norwegian Breakaway as the “newest and largest ship embarking from NYC” to winter destinations including the southern Caribbean, Bahamas and Florida.